The purpose of the New Indigo foresight process was firstly to identify the most important and most relevant drivers of current S&T cooperation between India and Europe. Its second aim was to engage relevant stakeholder groups in a structured discussion on what this cooperation should look like in 2020. Thirdly, long-term and short-term policy-recommendations for shaping this future have been developed. As one of the BRICS countries, India is among the biggest and most dynamic emerging economies worldwide, which increasingly excel in the area of science and technology (S&T). In her address to Parliament on 4 June 2009, India’s President declared the period from 2010 to 2020 as the “Decade of Innovation”. The main aim of the declaration is to develop an innovation eco-system to stimulate innovation and to produce solutions for societal needs, such as healthcare, energy, urban infrastructure, water and transportation. Although the gamut of innovation is vast and includes efforts in many sectors, the underlying emphasis is to boost advances in S&T. Focusing on the same time horizon, the European Union introduced the “Innovation Union”, a flagship programme of the Europe 2020 Strategy to be implemented from 2014 to 2020 to secure Europe’s competitiveness and face major societal challenges at a global level. The European Commission and the European countries perceive India as an important future partner when it comes to S&T, as is evidenced by the fact that India was chosen to be the target country of the first pilot initiative of the Strategic Forum for International Science and Technology Cooperation (SFIC), an advisory body to the Council of the EU and the European Commission. One of the EC funded instruments targeting S&T cooperation between India and Europe is the ERA-NET New INDIGO. The project fosters multilateral cooperation between the two regions by supporting the bi-regional policy dialogue, networking different stakeholders in the field of S&T cooperation, analysing current cooperation, identifying common priorities and implementing multilateral (networking and research) projects. Following a participatory approach leading to policy-recommendations, the project conducted a one-year foresight study on the future of this cooperation between India and Europe. The consortium agreed to envisage a 2020 perspective, in line with the Europe 2020 strategy and the Decade of Innovation announced by the President of India in 2009. The similarity of the political initiatives in both regions was the background against which a success scenario-based foresight study was conducted: a desirable scenario of what S&T cooperation should look like in 2020 was developed and respective instruments were identified that might be of help in turning the normative success scenario into reality. The main methodologies used where Delphi analysis, scenario building, expert workshops and a bibliometric analysis. The methodological setup of the New Indigo foresight process is based on the idea that three main stakeholder groups are the most relevant for future EU-India S&T cooperation: policymakers, programme owners and scientists. The policymakers design the framework conditions within which S&T cooperation takes place and decide upon support structures. The programme owners/managers adopt an intermediary position between policymakers and scientists. They know both worlds, co-develop and implement dedicated programmes and, thus, are engaged in the actual implementation of S&T internationalisation policies. The scientists, finally, are the ones actually performing research cooperation. They are the ultimate target group and main beneficiary of all internationalisation policies. The New Indigo foresight exercise started at the end of 2010 with preliminary desk analyses on drivers of S&T cooperation and EU-India co-publication trends. On this basis, evidence on the current status and thematic focus of S&T cooperation between India and Europe could be provided as an input to the foresight and wider policy processes. Furthermore, in a series of online consultations as well as expert workshops, factors (‘drivers’) have been identified that are likely to influence what future collaboration might look like in the year 2020. Figure 1 (p. 3) describes our implementation model that can roughly be divided into two phases: one before and one after the first draft of a success scenario. 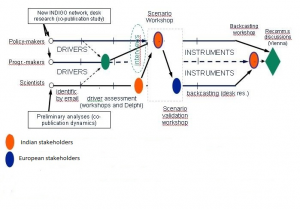 The scenario development phase spans from the preparatory analyses via driver identification by literature analysis, email consultations, online Delphi for driver identification and validation, and expert workshops leading to a draft success scenario. The second scenario validation phase involves consultations on the validity and viability of the success scenario for different stakeholder groups, backcasting activities trying to indicate paths towards the success scenario, as well as the development of instrument and policy recommendations. In order to gather data and opinions from the three core stakeholder groups as mentioned above as well as include and engage them in the process of thinking about future S&T cooperation between the two regions, we opted for a twofold data collection approach: In the case of policymakers and programme owners, we arranged for physical workshops in the framework of the New Indigo project and beyond. By contrast, we approached the scientists by means of an open email consultation followed by a Delphi survey. The main reason behind these different ways of approaching the stakeholder groups is the fact that policymakers and programme owners concretely concerned with (and thus knowledgeable about) this form of cooperation are few in number. For these few, however, our preparatory analyses and project experience suggested that they have a good overview of the current state of programmes and future plans. Thus, it makes sense to try to investigate their expertise in more depth and engage them personally, not least because they have a major stake in designing the political framework conditions for the future they are reflecting upon in the foresight analysis. As regards the programme owners, again, their number is limited, and several of them who are engaged in EU-India cooperation in their national contexts also act as policymakers (especially in the smaller EU member states and in India). It was this group of stakeholders that was most easily accessible via the New Indigo project as they formed part of the consortium as partners or members of the steering committee. The scientists, however, are a much larger stakeholder group. We avoided to randomly approach large groups of Indian or European scientists and did not invite small groups to give us their individual and, given the large size of the population, unrepresentative views either. Instead, we considered it most reasonable to approach those scientists who already have cooperated. We decided to revert to co-publications as a proxy for cooperation experience, i.e. we looked for scientists from each of the regions who have already published with scientists from the respective other region and engaged them via an online consultation and Delphi survey. The whole exercise dealt with the constraints proper to international S&T cooperation foresight (cf. Degelsegger, Gruber and Wagner 2011 in EFP Brief 201): increased complexity due to the bi-regional perspective combined with very limited time resources of and difficult access to policymakers. Moreover, members of this stakeholder group are, as said above, in a position not only to assess but to significantly shape the future we aim to look at, which again adds complexity to the process as few relevant variables can be considered totally external. Regarding the scientific community, it is not easy (due to time constraints on their side and negative experiences with policy consultation processes or simply disinterest) to attract those scientists to the foresight exercise who are excellent in their field, willing to cooperate and knowledgeable about science cooperation (and willing to adopt a meta-perspective on what they are doing). As depicted in Figure 1 (p. 3), the different stakeholder groups were firstly assessed in parallel and the assessment results of one group then fed into the subsequent discussions in the other group(s): For example, drivers identified by scientists were categorised and prioritised by programme owners and policymakers. In a second Delphi round, the results of these discussions were again presented to the scientists for validation. This implementation method proved very fruitful regarding the participatory aspect of the foresight exercise: while, for example, some of the drivers identified by scientists seemed rather obvious to programme owners or policymakers, usually experts in the field of STI cooperation policy, discussions showed a growing understanding of the scientists’ problems and triggered some revised viewpoints. At the same time, the scientists, confronted with the success scenarios (based on programme-owner assessments of urgent and feasible drivers), came to harmonise and translate their expertise and experiences in a way that the latter could inform recommendations on policy instruments. With regard to the mediation of different stakeholder levels, one of the lessons learnt is that taking the time for a kind of ‘preparatory’ discussions is a necessity. Such discussions are yet not focused on a concrete set of drivers or scenarios but target the topic of cooperation rather openly. While such time may be perceived as wasted on side topics or general statements, it is actually necessary for the group members to align their thinking and experiences with each other and in view of the expected output of the meeting. Even later in the foresight process, participants (not all of whom had participated in the process from the start) had to be given time to start discussions “from zero”. The task of the workshop leader is to pull together and harness the discussions reasonably without frustrating individual input while building understanding for different levels within S&T cooperation. Another lesson learnt – which is actually well-known but became quite apparent in this particular international cooperation foresight – is the contradiction of the participatory (integrating all inputs to the extent possible) and the strategy building aspect of success scenario-based foresight: Involving a broad range of stakeholders makes it difficult to avoid a fairly general wish list of success indicators; at the same time, reasonable recommendations beyond commonplace solutions had to be developed. Again, it is upon the process designers and workshop leaders to guide discussions towards an agreed but still fairly concrete selection of instruments. New Indigo has had the opportunity to present the results of its foresight study, particularly the short-term programme recommendations, not only in form of a deliverable to the European Commission, but in front of a high-level political stakeholders audience during the regular session of the India Pilot Initiative of the Strategic Forum for International S&T Cooperation (SFIC-IPI) in Vienna on 30 November 2011. The presentation was followed by comments and a discussion with the SFIC-IPI members and contributed to contextualising and complementing the short-term programme recommendations. Additional perspectives were considered in the discussions, for instance regarding the challenges the implementation of the programme recommendations faces in different national contexts, as well as regarding new forms of support to bi-regional collaboration (Networks/Virtual Centres of Excellence, part-time academic personnel exchange etc.). The most prominent outcome of the process is the integration of results into the draft EU-India Joint Strategic Agenda (currently in preparation, see: http://ec.europa.eu/research/iscp/index.cfm). “By 2020, success in EU-India S&T Cooperation has been achieved by support to activities in each of the three areas of facilitating, funding and training. With regard to the facilitation of cooperation, researchers have funds and fora available to meet their Indian/European counterparts. A significant number of established multidisciplinary networks of groups and senior scientists form the core of ongoing cooperation. Research funding schemes offer dedicated project top-up funds for mobility. Barriers for short and long-term mobility such as burdensome visa procedures have been removed and, at the same time, brain circulation channels have been opened that also facilitate career development. Common standards are in place together with a standardisation in the area of IPR, allowing for fair treatment of each partner in bi-regional consortia and avoiding additional administrative efforts for the coordinators of joint projects. Formalised institutional cooperation has increased, for instance in the form of agreements between standardisation agencies (standardisation, joint testing, measurement, data, samples, etc.). Evaluation of collaborative projects and ex-post evaluation of project outcomes is uniform and transparent. As regards funding, the availability of dedicated public as well as philanthropic financial resources is significantly higher in 2020 than it was in 2010, coupled with an increased and explicit donor commitment. Regular bi-regional calls for proposals with real joint funding (as well as virtual common pot funding programmes complementing bilateral programmes), complemented by co-funding from the European Commission, are in place. Scientists benefit from exchange schemes in the frame of specific research infrastructure in both regions as well as from access to joint infrastructure. In order to allow scientists to quickly find information and access to EU-India S&T cooperation funding, a single entry point information hub (e.g. in form of a website) for all Indian-European research funding offers is available. The results of successful joint multi- and bilateral S&T cooperation are presented to an interested business community in dedicated showcasing conferences, facilitating academia-business-society linkages. Society is involved in designing cooperation policy, priorities and the goals of collaborative research, while science itself applies a transparent and rigorous peer review mechanism. R&D activities of small and medium enterprises (SMEs) are scanned both in India and Europe and showcased in both regions. Successful or potentially research-performing SMEs are routinely approached to be updated on possible public research partners. Finally, dedicated funds are available (as part of wider S&T cooperation funding) for hiring outside PhDs who can support the creation of and stabilise long-term exchange between senior scientists. Two-way short-term mobility of postdocs, postdoc exchange schemes supporting young scientists to come back to their home institutions (and countries), and similar programmes are also facilitating brain circulation. When it comes to training, a central virtual platform exists for preparing, accompanying and motivating multilateral joint research as well as for the development of joint degrees and the exchange of PhDs in sandwich programmes. Activities and results are presented in actual workshops once a year. These support structures trigger significant brain gain in combination with mobility schemes mentioned above, for instance when an Indian fellow spends two years of his/her PhD in Europe and the rest of the time in India or vice versa. There are mechanisms in place for the development and quality control of joint PhD programmes. Joint programmes take advantage of online and virtual learning systems” (Blasy, C. et al., 2012: 31-32). Blasy, Cosima; Degelsegger, Alexander; Gruber, Florian; Lampert, Dietmar; Wagner, Isabella (2012): New Indigo International S&T Cooperation Foresight: A study of S&T cooperation future(s) between Europe and India. Project Deliverable 4.5 to the European Commission, online at http://www.newindigo.eu/foresight; last accessed on 13 October 2012. Degelsegger, Alexander; Gruber; Florian (2010): S&T Cooperation Foresight Europe – Southeast Asia, in: Форсайт (Foresight), 4(3), 56-68.
ipts/Joint Research Centre of the European Commission (2007): Online Foresight Guide. Scenario Building, online at http://forlearn.jrc.ec.europa.eu/guide/3_scoping/meth_scenario.htm; last accessed on 13 October 2012. UNIDO (2005): Technology Foresight Manual. Volume 1 – Organization and Methods, Vienna: UNIDO. Technopolis Group et al. (2008): Drivers of International Collaboration in Research. Background Report 4, online at http://ec.europa.eu/research/iscp/pdf/drivers_sti_annex_4.pdf, last accessed on 24 July 2011. Georghiou, Luke; Cassingena Harper, Jennifer; Keenan, Michael; Miles, Ian; Popper, Rafael (2008): The Handbook of Technology Foresight. Concept and Practice. Great Britain: Edward Elgar Publishing Ltd.